Hiya guys, it's TGIF time! It's been a long week, but now it's time to kick back, relax, and... BUY ALL THE POLISH!!! Sorry, my inner fiend got loose there for a second. I'm just extremely excited for all the new releases tonight and throughout the weekend. 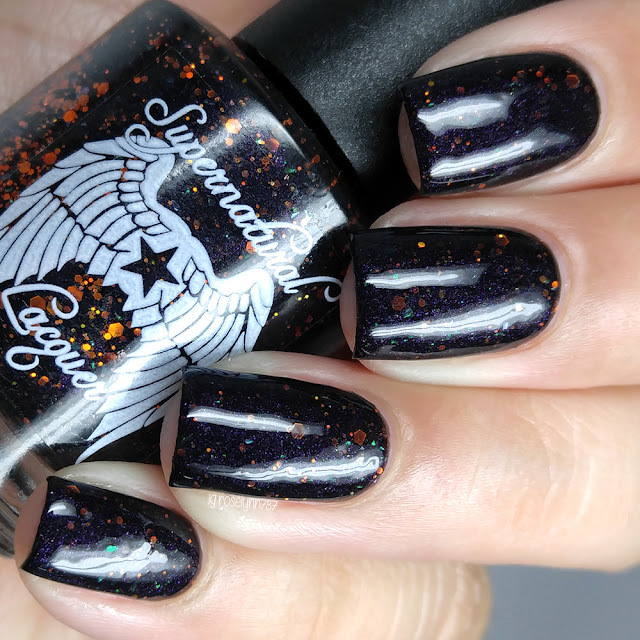 Today I'm sharing swatches and photos for the Hex Box from Supernatural Lacquer. This is one of many items in the shop tonight, which includes the Coffin Gems Trio I reviewed a few days ago. Let's get to it! The Hex Box from Supernatural Lacquer will be available for pre-order tonight, September 30th at 9PM EST thru October 2nd. Definitely don't wait to the last minute because there is a cap on this box set to 90. Each box will contain the full-size polish, nail charm, acetone additive, and one goodie for $13 shipped (US, international rates available). Salem can be described as a deep, deep purple, almost black, jelly with orange, purple and green holo glitters in numerous sizes. The formula has a good application, really not as sheer as I was expecting for a jelly. It does tend to favor using thicker coats to avoid clumping around the edges. 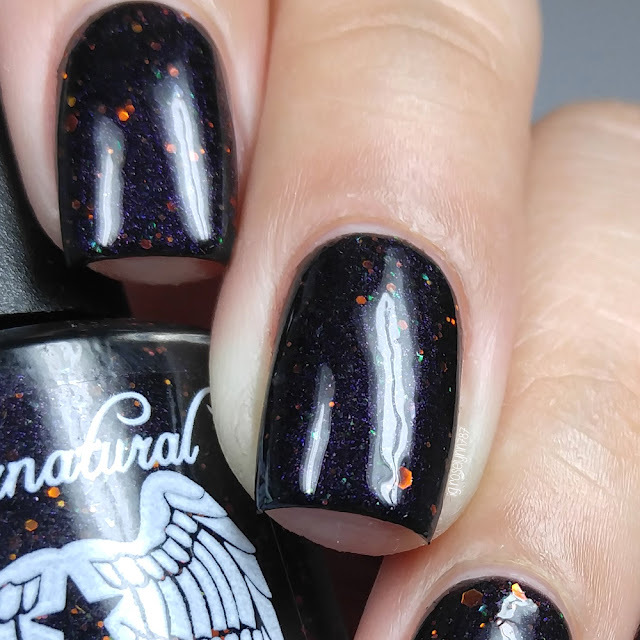 This shade dries to a gritty finish due to all the glitters, so I chose to double-up on the topcoat for a smooth finish. Also there is no need for glitter fishing, the brush strokes end up being really loaded on their own. Shown is two coats sealed with double the topcoat. Now here's a closer look at each one of the items! 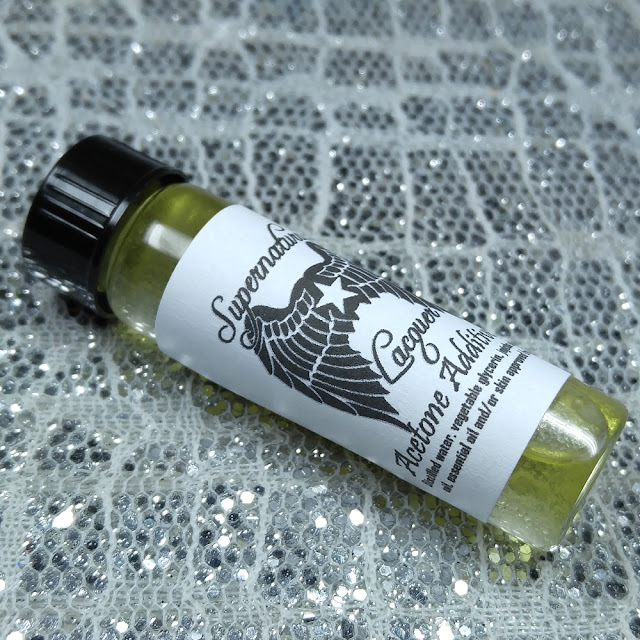 This additive sample is a "Harvest Gathering" scent - pumpkin, apples, crunchy leaves and a touch of pumpkin cinnamon spice. Okay... You guys can't tell me that this combination doesn't scream Fall to you?! I'm a huge personal fan of Supernatural Lacquer's acetone additive and have been using it for about two months now. I will be doing a separate review on this at a later date, so be sure to come back and look for that! Due to feeling a bit under the weather this week, I haven't had a chance to use this new set of decals from Green Goddess Creations. But this isn't a new brand to me and I actually own quite a few different sets from their shop. 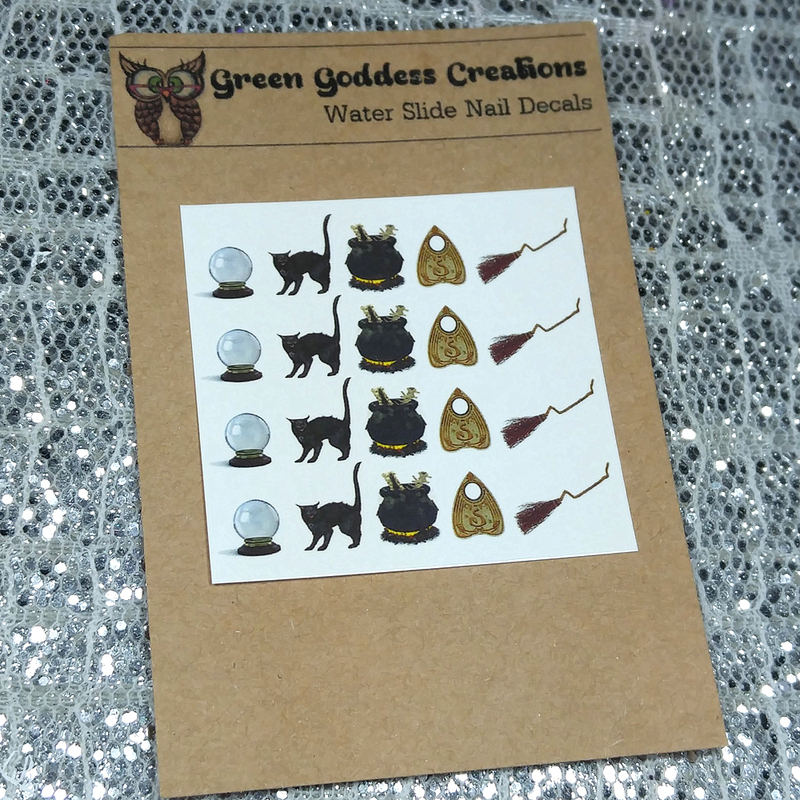 Definitely recommend these to decal fans, such as myself, as they are quite easy to use. And to mention I love the variety the shop has to offer - I've been able to purchase everything from Pretty Little Liars to Little Mermaid to Doctor Who. 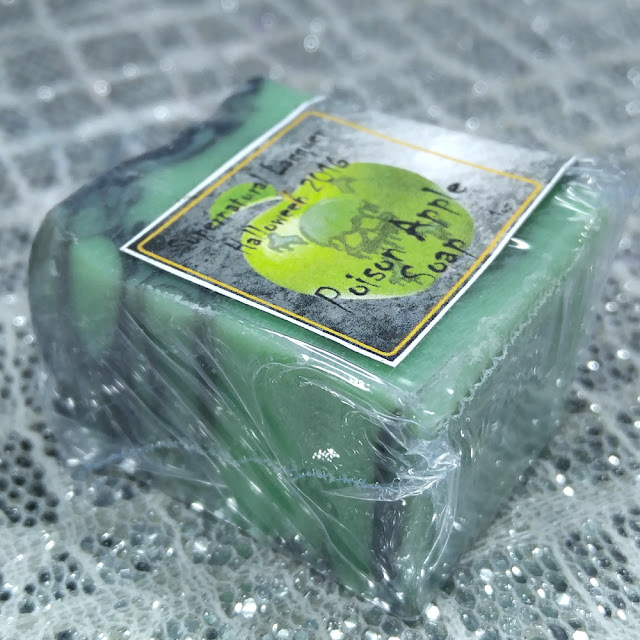 The Poison Apple Soap was one of the first things I opened from the box, because I was intoxicated with the delicious aroma. Seriously if poison apples would really smell like this I'd probably be a goner, haha. But really I have loved having this in my soap dish in the bathroom this week! The smell carries in the air and not to mention felt so cleansing for my hands. Definitely adding this shop to my 'to buy from' list because as soon as this is out I will be picking up other scents. 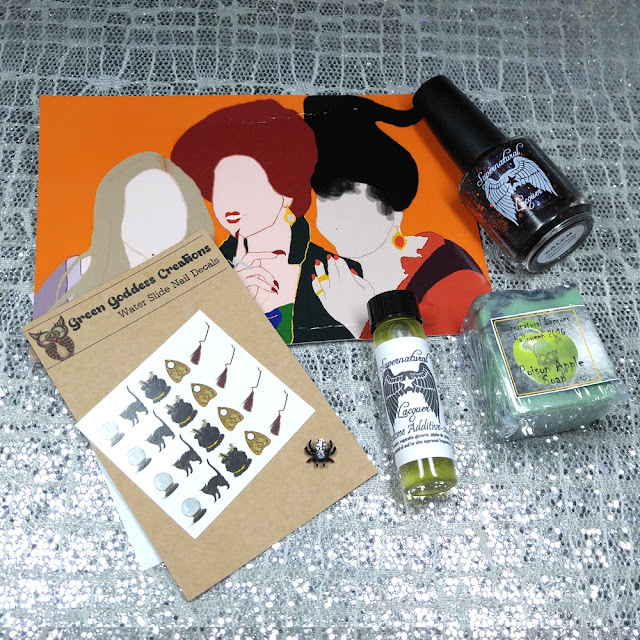 Overall I love everything about this box, all the Halloween bits and pieces have me in heaven. I also find the box extremely affordable for the contents you'll be receiving. 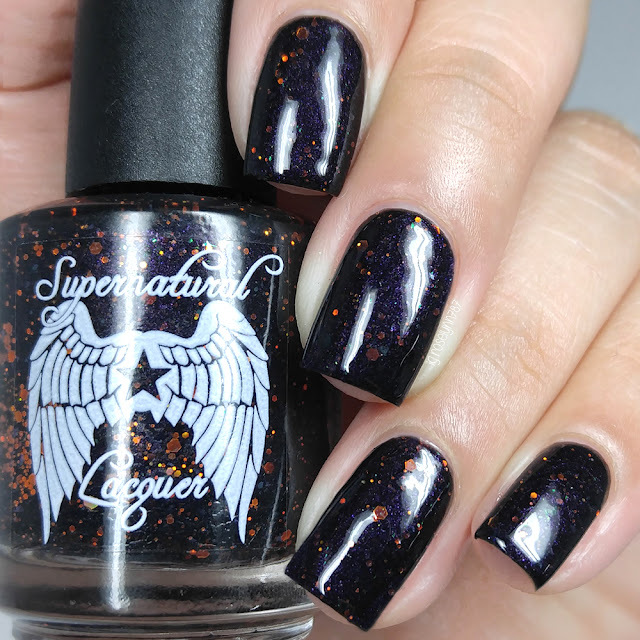 And because it's not all from just Supernatural Lacquer, you have the opportunity to try a few new products! Especially the acetone additive, which as I mentioned earlier I personally cannot get enough of and highly recommend. I'd love to hear what you think of this box, will any of you be picking one up tonight? 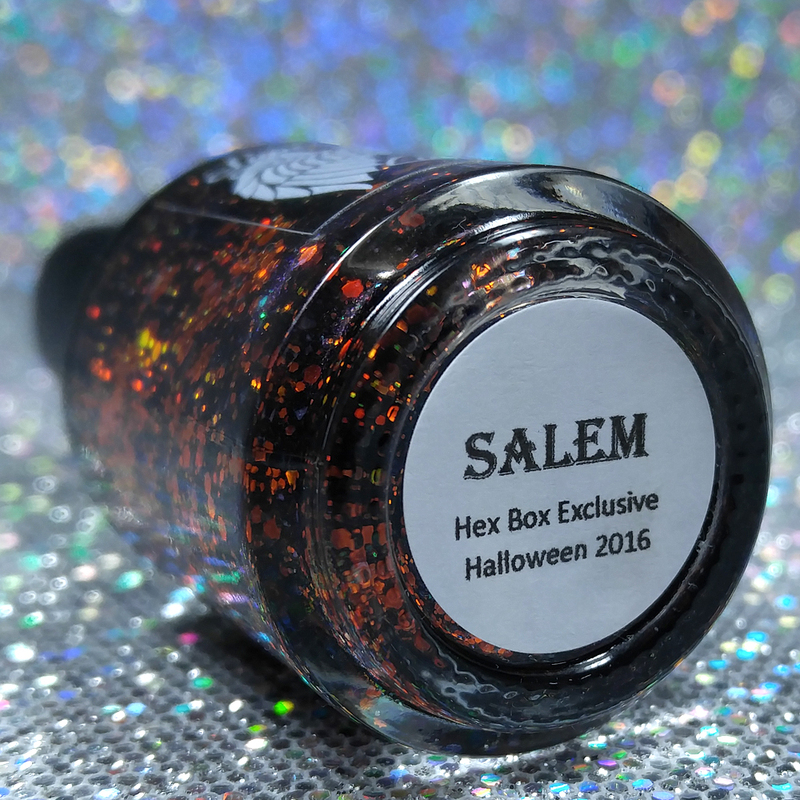 To recap, the Hex Box from Supernatural Lacquer will be available for pre-order tonight, September 30th thru October 2nd. Definitely don't wait to the last minute because there is a cap on this box is set to 90. Each box will contain the full-size polish, nail charm, acetone additive, and one goodie for $13 shipped (US, international rates available). This looks like such a great box for a great price! That polish is so pretty! Such a fun box idea! GAH....and I was going to skip this box because I don't like black polish! Lady, you have *never* had a bad swatch! 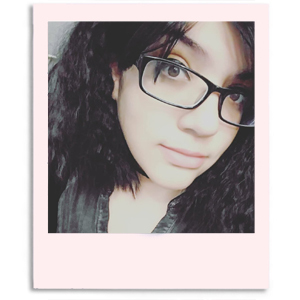 I seriously can't get over how gorgeous your photos are, I'm seriously drooling over here. What an awesome box! I'm in love with that polish. What a great box! I got one ordered! So cool! Your macro shot just makes me drool!! Oooooo this box is great! Loving that polish!